Gorgeous rug! 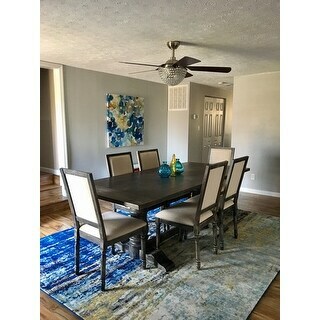 We used this for staging a home and it ties in the blues perfectly without overwhelming the area and becoming the focal point. The rug is nice to walk on and should stand up well to traffic. Enliven your living room or hallway with this abstract rug from Porch & Den. The gorgeous brush stroke pattern features vibrant shades of blue, yellow, and grey. Constructed from durable, this non-shedding rug is perfect for busy areas. Dimensions 144.0 In. X 12.0 In. X 12.0 In. The rug is gorgeous. I have gotten so many compliments on it. This is a beautiful rug. I have the rug in my entry hall, it adds the perfect amount of color. The size and thickness are ideal for the area. 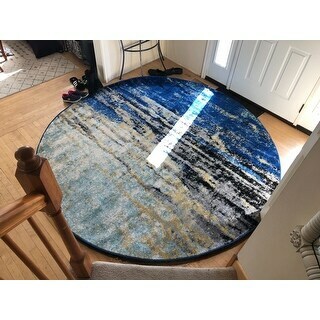 I would highly recommend this well made and beautiful rug. The colors are the same as in the picture. Vibrant colors, great area rug. This rug is a great, affordable option for a non-traditional rug. It added a pop of color in our living room that is a little more modern and unexpected than typical rugs that are very geometric. 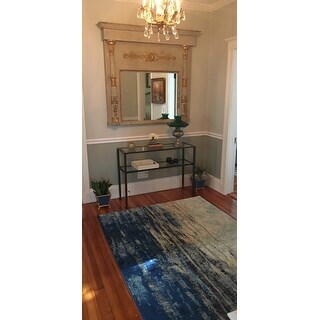 The main blue on this rug is a medium blue, with gradients of navy and a lighter blue that leans towards the aqua family. The other colors are a cream-white, medium yellow, gray and black. The pile is soft but not too plush. It's a good option for us since we have a dog and need a lower pile that will vacuum easily, without giving up softness. The print is very forgiving, as small stains will not show as readily. Really lovely carpet but the colors are off. There is absolutely nothing green about the rug. I don't even think there's green in it. It's closer to what the picture shows are the blue is more along the lines of royal. If you need light blue, yellow/gld, gray, bllack and royal blue, then this rug is for you. I absolutely love the design, and it matches the picture very well. However, it only took a few months for a wear pattern to appear along one edge. I am not using a rug pad, although I'm not sure that would help. The softness feels like an IKEA rug. More crunchy and rug burny rather than soft and plush. No worse than other rugs of this material. Overall, I am satisfied with it for the price. After a couple years, I'll probably want something different anyway. I purchased this runner to be in front of a bench close to my front door, which is a high traffic area. The pile is short and good for a high traffic area, but the rug looks cheap in person. The good news is that the colors are true to the online photos, but in person the colors don't blend well together and it gives the rug a digital/pixelated look, rather than a smooth blend of colors. So far I'm happy with the rug. It's a low pile rug that looks great against my grey wood floors. Colors are vibrant and match the photos. 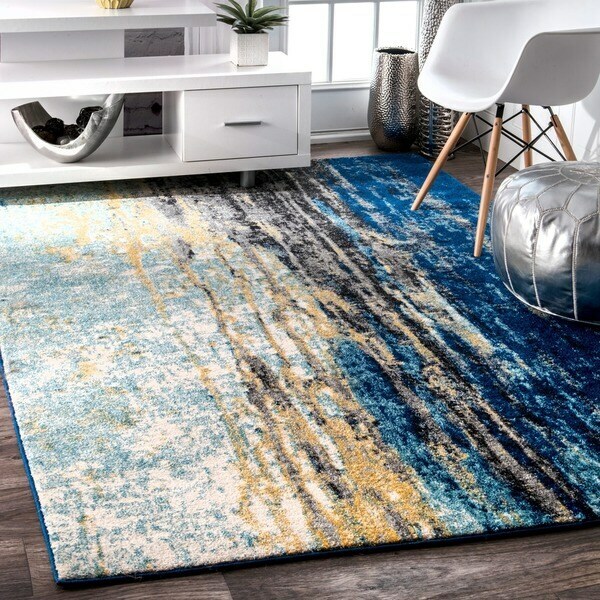 Like this rug, but with all of these rugs you will need to purchase a non-skid backing of some sort if you plan on having this rug on laminate or wood or tile flooring. The rug is nice, good quality, looks good! Looks great in the hallway! The rug is as advertised in terms of colors and brightness. However you can tell that it's a cheaply made rug and feels like cheap carpet and not like a nice rug. One of the best purchases I've made from Overstock. It's comfortable, well made, and even better in person! Gorgeous rug! this is a well-made synthetic rug & it has a nice look to it. i think the photos on the site make the colors look a bit more vibrant/ saturated than it is in person, but i'm still very glad i bought it. i have my couch positioned over the sky blue/ yellow half (which is ok), so mostly the darker blues/ black is visible (that half is more sophisticated/ pretty). i think it's a solid rug for the price. Beautiful rug with vibrant colors. Good thickness with a quality rug pad under it. It does have a synthetic feel to it. Beautiful rug. We purchased this to stage a home and it looks great in the large living room with a grey sofa and two blue chairs. The rug seems to be well made and will hopefully hold up through a few moves / re-staging. The pictures do not do this rug justice! It is so nice in person! Love it! Great rug. Colors true to website. Looks great!! 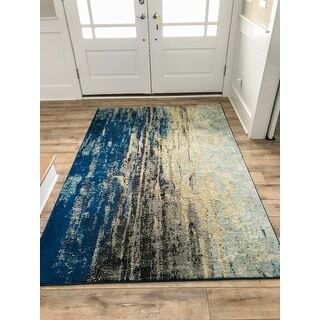 Great rug for my entry door in my new house. I have always heard good review form my guests and always been asked from where I have purchased this!! And it is from Overstock. Not as vibrant i feel in real life but still a great accent piece. This rug is just as beautiful in person as it is in the picture. The blue is vibrant! We put this rug in our office, and is a medium traffic area.... Very well made carpet and would buy again to put in another room for sure! Nice rug. Seems to be holding up with 7 dogs in the house. Looks better than the picture, to me. It's just a bit not as vivid, which I prefer. Have had it for a while, high traffic area, and it still looks great! Cleans easily with just otc cpt cleaner. "Is there any teal color on it?" "Hello, Is this round or square? The title says round but the photos show square and also in the description." This is a square rug. "Why is the rug adverstised as 66 anc change, but when you click on it and it opens its own page it's 109?" "Do you have 6 inc ?" "Is there black in this rug?" Yes, there are accents of gray. "does this rug come in a 3 x 3 round"
"Does this rug come in 6'?" Unfortunately, we do not currently carry this rug in a 6 ft option.